Today's Draw: Justice from the Art of Life Tarot in the Negative Influences to Avoid position from the Deck of 1000 Spreads. Do you catch yourself sometimes being untrue to nature? As you get older, do you find yourself becoming more yourself? What have you been denying yourself by "playing the game" (or do you simply deny ever playing it to begin with)? As a tarot reader, I don't reversals. Which is to say that, when you turn a card over and it's upside down, I don't read it any differently than if it showed itself right side up. A lot of tarot readers do read the cards differently in these instances, and the meanings are roughly the opposite (or less well aspected) of the meanings they'd be right side up. Anyway, today's draw is why I don't read reversals. To me, in a reading, there are plenty of opportunities to read a card the opposite of the way its meant to be read. For example, we wouldn't normally consider "being yourself" something negative or something to avoid. So this is a case in which you read the card the opposite. What to avoid? NOT being yourself. Did I just hopelessly confuse everyone? I hope not. Because "being yourself" is also not the usual meaning of Justice...haha. But it is in this deck, as evidence by the quote "to thine own self be true." In many ways, life teaches us to be "false" to ourselves. When people say, "how are you today? ", the expected answer is "fine, and you?" Meanwhile, we may actually have a bad headache and not really give a damn how the other person is feeling. But it goes beyond this. Somewhere along the line, we learned that there are things you don't say in polite society. There are things you never admit to others. Things you hide from the neighbors. Things you hide from the family. There are clothes you shouldn't wear. Ways you shouldn't be. Things that are better left unsaid. The weak pretend to be tough. The smart pretend not to know it all. The angry pretend to be otherwise, while silently simmering within. We don't talk about money. We don't talk about religion. We don't talk to strangers....phew! By the time you get past all the things you shouldn't say, reveal or be, how could anyone be "true"? I think the older we get, the closer we get to being who we truly are. We drop the facade and say "eff it. If you don't like me as I am, then step aside." At 50, I'm kind of getting there. Which could frighten people. Because I think, in some ways, I've always shown the side that people normally hide...haha. So what do I have left to reveal? But I think we come to a point in life where the weight of the facade is just too heavy to bear. There comes a time when trying to think up a "nice response" just takes too much energy. And we reach the place where we no longer want to be around fake people who like us because we're being fake with them. Perhaps that's why the creators of the Art of Life tarot chose a self portrait of Van Gogh as the visual to pair with this quote. Because the weight of being what everyone expects you to be and what polite society accepts can drive you mad. 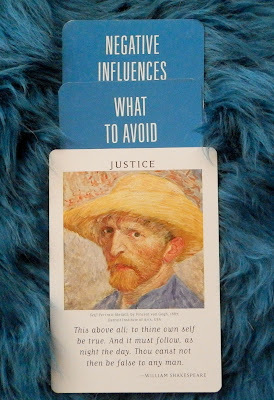 Which is why this card is Justice...it's the price you pay for not being yourself. Every time I think I've learned the lesson of being true to myself, I get caught in some sort of situation where I've said yes to something for reasons other than I wanted to. Or where I've somehow bent too far to accommodate something. This is an issue we learn to put on in layers from an early age. And it's one we learn to take off in layers as we reach our later years. Which begs me to wonder, what do we do it for in the first place anyway?